One of the newest sports websites that started in 2017: The Athletic. There are sites in various cities across the country with dedicated journalists covering all the local professional, college and high school sports with in-depth features and game stories. I joined the Minnesota group as a freelancer in the fall of 2017. Full-time Athletic writer, covering the NHL and Minnesota Wild, Michael Russo asked me to contribute as a freelance writer. Be sure to stop by The Athletic website to see all my contributions. The Huskies missed the NCAA tournament last season after four straight trips. With another year of experience, they hope this year will be much-improved. Minnesota hockey fans recognize Krissy Wendell as a standout hockey player for Park Center High School, the University of Minnesota Gophers and the Team USA in the Olympics. Now she's joined the FSN broadcast team to cover Gopher men's hockey. Rob McClanahan won a gold medal with the 1980 U.S. Olympic men's hockey team. He also was a standout player with Mounds View High School in the 1970s. Now his daughter Sara has carved out her own path as an athlete. After a promising season ending in disappointment for a No. 1 team bounced in the first round of the NCAA tournament, St. 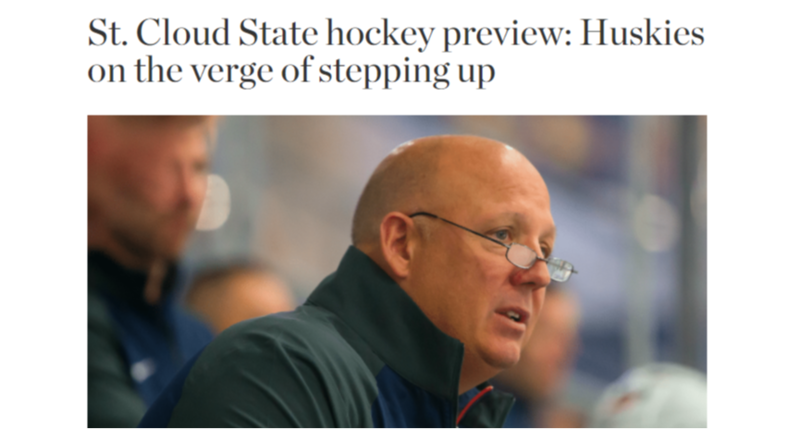 Cloud State will try to right the ship with a new head coach, Brett Larson. From the fans to the concession stand, get an inside look at the inaugural weekend for the Minnesota Whitecaps as part of the National Women's Hockey League. The Whitecaps started the season 6-0 before dropping a series. The support continues to be there with sold-out crowds at TRIA Rink in St. Paul. ​No Olympics this year, so the Gopher's are back to being the top team their used to with players like Kelly Pannek and Grace Zumwinkle leading the way. The Gophers hope to return to the NCAA Tournament. Minnesota Wild coach Bruce Boudreau did a double-take when Minnesota Whitecaps forward Hannah Brandt suited up for practice with the Wild. Brandt joined the Wild as part of the third annual girls' hockey weekend initiative.